* The primary mission of the temple. * Services the guests can easily offer in seva to the temple or deity. * Giving Vedic culture to the next generation. * Temple classes, the Sunday program and children’s schools and youth camps. * Vedic temples as centers of sacred knowledge. * The power of adult study groups, cultural and outreach programs, and festivals. * Utilizing temple restaurants, gift shops, exhibits, and support groups. * Ways of reaching more people, both in India and the USA. * The need and ways for promotion, and radio, television, and newspapers. * An action plan on how to cultivate Vedic culture in America. * Attracting and welcoming non-Indians and Western seekers for more support. * Starting a spiritual revolution in India and elsewhere. * Working with priests, rituals, and teaching the culture and traditions. * Unifying and organizing the Vedic community. 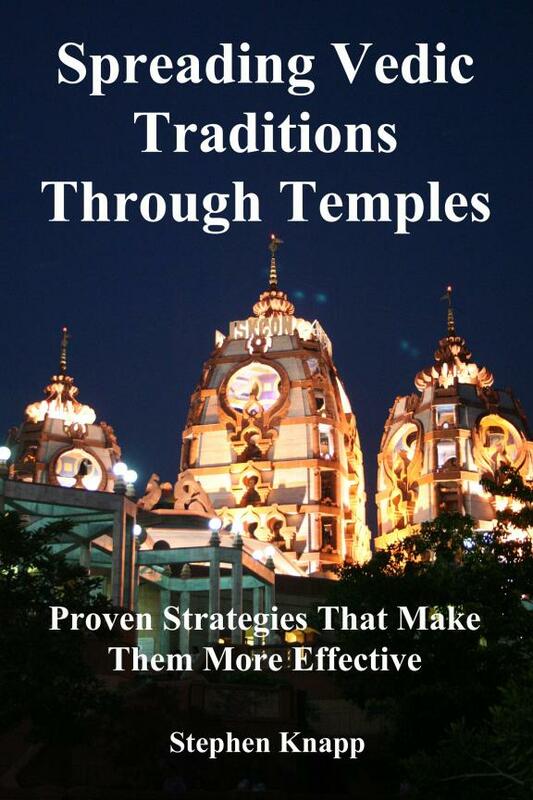 This book is especially good for temple managers and those who work with and support temples. This book covers many more methods that are not merely ideas, but are already being used in practical and successful ways to help preserve, promote and spread what is the last bastion of deep spiritual truth. As more temples are built in Western countries, these strategies will become increasingly important. Using these techniques as the basis of your ideas, your temple cannot help but be successful. Handing Over Temples to the Younger Generations * Why go to the Temple? This book is 186 pages, 6" x 9" trim size, $11.95, ISBN-13: 978-1478222996, ISBN-10: 1478222999. FOR THE NOOK E-Reader: Several of Stephen's books are also available for the www.Barnesandnoble.com Nook E-Reader. Just do a search for Stephen Knapp on their site. ADOBE READER E-BOOK EDITIONS for Stephen's books can also be ordered for reading on your computer no matter where you are, from www.lulu.com. Just do a search for Stephen Knapp on their site and choose the books you want. To get the latest version of the free Adobe Reader to read the Ebook, use this link: http://get.adobe.com/reader/otherversions/.